Lovely house of honey-coloured Charente stone, in walled grounds offering complete peace, privacy & relaxation as well as safe, spacious play areas for children. Anam Cara offers ancient character & modern comforts at an affordable price. Child friendly. Safe pool. Perfect for couples or families with children. Near to an ancient church in a delightfully pretty village. WALK to a friendly bar/restaurant. 5 mins to shops, supermarkets, cafes, bars & restaurants. 5 mins to the Charente river & the Rejallant - a free leisure base/bar/restaurant. Easy to get here by rail, cheap flights & discounted ferries. Ideally situated for enjoying the sun & warmth, beautiful scenery, lively activities & cultural heritage of Ruffecois, as well as trips to Futuroscope theme park, nature & wildlife parks, medieval towns, Poitiers, Confolens, La Rochelle, Limoges & Cognac country. Just ask & we'll send a 100 pic photogallery & feedback from guests. Anam Cara (Celtic "soul friend") is a place to restore & refresh the spirit. A chance for a real change of pace. Whether you want to be active in town, or in stunning countryside, or whether you prefer peace & relaxation at home, Anam Cara & the Ruffecois area offers you a warm welcome & everything you could need for a memorable and rejuvenating holiday in one of the sunniest parts of France. Plenty to do at home. You have a very large lawned garden with a grapevined suntrap patio dining area, as well as areas of shade under fig, beech, peach, cherry, magnolia & medlar trees. Children have space to explore & play safely & there is a covered sandpit for younger children. You can play badminton & other games, laze in the hammock listening to birdsong, or cool off in the private above-ground pool. 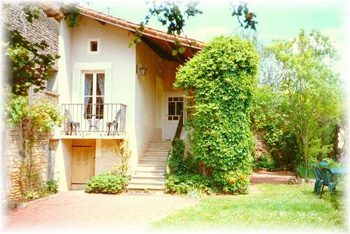 Anam Cara is NOT part of a gite complex: You have private & exclusive use of all facilities. In the evening, help yourself to some parsley, rosemary, basil, thyme, chives, garlic, onions or tomatoes to add to your meal, turn on the garden lights & relax in the warmth as you dine outdoors under the stars. A very short walk takes you to tennis courts, a bar & restaurant or glorious sunny woods, fields & country lanes. Well Equipped & Well Furnished Accommodation combines ancient character with modern comforts. There are two attractive, light & airy double bedrooms, both with clothes storage, bedside tables & reading lights. All household linen is provided & your bed is made up before you arrive. A large, chandeliered living room, with exposed Charente stone walls, beamed alcoves & fireplace with woodburning stove, looks via French windows onto a restful balcony overlooking grapevines & mature gated gardens. Comfortable, airy bedrooms, both with sitting space and views of the orchard and an ancient church. Additional double sofabed in the lounge. Cot available. The pretty, tiled bathroom adjoins the main bedroom and has shower and basin, with a separate WC. The house is equipped for indoor and outdoor dining. The dining area (to seat 6) in the living room looks out through French windows onto grapevines, lawn and beautiful trees. Barbecue available. Well-equipped kitchen (including toaster, coffee maker, new gas cooker, new fridge-freezer, etc) overlooks the patio dining area. The kitchen receives morning to early evening sunshine. Rental includes all utilities, heating, logs, bed linen, towels & a welcome pack giving you all you need to know about about where to go, what to see & how to get there.. Woodburning stove. Lots of interesting books in French and English(including "Anam Cara" by John O'Donohue) , children's games, radio, tape and CD player, and music are available. TV for DVD playing. DVDs provided. Let us know what you like to do and we will email you information sheets to help you plan your holiday. The area is full of of attractions for both adults and young people. Easy access to sunflower fields, vineyards, Futuroscope theme park, lively towns, unmatched chateaux, bathing lakes, mills, boating, swimming, superb restaurants, friendly bars, picturesque & interesting villages & a region of rich cultural heritage. A very short drive or bike ride takes you to indoor & outdoor pools, river bathing, horseriding, canoes, kayacs, picnic areas, a bathing lake with beach, a variety of interesting cafes, bars and excellent restaurants. Or you can go: fishing, explore the forests of Ruffec, buy fresh farm produce at local markets, visit the cinema, clubs, outdoor concerts, artists' workshops, taste the incomparable food and wine at "Gourmet Days". Or take a look at: the Chateau of Verteuil, the panoramic views at Barro, the medieval church of Ruffec, the silver mines of Melle, the 12th century abbey at St Amant de Boixe, the protected medieval village of Tusson with spectacular gardens and a museum of rural life, the aquatic labyrinth at St Fraigne, restored mills at Condac and Villefagnan, the*frescoes in the Chapel of Courcome, the International Dance Festival at Mansle (don't miss the fuchsia gardens), the restored chateau of Bayer - or just explore: You will find beautiful places, local fetes and festivals and real French life. Or go east to the porcelain centre in Limoges and the International Music Festival of Confolens; west to the superb aquarium & beaches of La Rochelle; north-west to the "Green Venice" of Marais Poitevin; ; south-west to Cognac(for tours and brandy tasting) or the superb Roman amphitheatre and town of Saintes. Or take the TGV (fast train) from Ruffec to Bordeaux or Paris (just 2 hrs) for the day. Children are very welcome. Child friendly. Safe play areas. Safe pool. Cot available. Travel Information (Cheap ways to get here by air, sea, road and rail. Discount ferries), Nearby cafes and bars, Nearby Chateaux, Places to visit, Boats & Boat Trips, Boulangeries & Patisseries, Restaurants, Wine, Cognac & Pineau, Lakes, Nature & Wildlife Parks, Supermarkets, Activities for Children, Villages to visit, Ruffec town, Days out to Angouleme, Cognac, Saintes, Poitiers, Confolens - and anything else you would like to know. Easy to get here by rail, cheap flights & discounted ferries. Ask for our travel information sheet which provides all the options for getting here inexpensively & without stress. Contact Charente Holiday Cottage Email us for availability, prices and a Booking Form.